1. Combine the berries and sugar in a saucepan and bring to the boil over medium heat until defrosted, then remove from the heat immediately. Place into a liquidiser or blender and blitz until smooth. 2. Pass the purée through a sieve, keeping the liquid. Add the orange zest and place into a covered container in the fridge. 3. Preheat the oven to 150°C, gas mark 2. Put the hazelnuts on a baking tray and toast for 10 minutes, until golden. Place into a food processor and blitz to a fine powder. 4. Combine the flour and the cinnamon in a bowl. Add the butter and rub in with your fingertips until the texture resembles coarse breadcrumbs. Fold in the ground hazelnuts, sugar and salt so that the mixture comes together in clumps. Chill for at least 1 hour in the freezer. 5. Preheat the oven to 200°C, gas mark 6. Spread the crumble mixture out evenly on a baking tray and cook for about 15 minutes, or until an even golden brown. Cool to room temperature and store in an airtight container. 6. To assemble, divide the fruit purée between 4 ovenproof and flameproof ramekins or cast iron dishes. Scatter over the berries. Place onto the barbecue and heat for 3 minutes over a low heat. 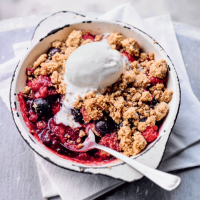 When the fruit is warm, sprinkle the crumble over the top and cook for an additional 2 minutes until hot throughout. Serve with the ice cream.